I thought my dinner last night looked purty (I think due to my Fiestaware plate and the orange-themed dinner), so I thought I'd share. It was also delicious. Those are Mango Coconut Curry Nuggets, an adaptation from a Weight Watchers cookbook recipe. Basically, you take boneless chicken, cut it up into chunks, and then coat it with a mixture of mango chutney, curry powder, and cumin. Then dredge each piece in a mixture of panko or breadcrumbs and coconut. I honestly didn't think the coconut added much so I might skip it next time. I used fresh frozen coconut--recipe called for sweetened flaked coconut. Recipe also didn't have breadcrumbs, but I felt that would work better. I like using panko (Japanese breadcrumbs) because they're usually made with less preservatives and weird ingredients than regular breadcrumbs. Bake for 15 min in a preheated 475 degree oven. Hot stuff! 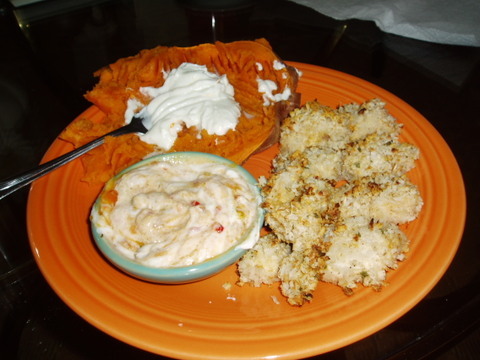 I ate them dipped into a mixture of mango chutney and fat free sour cream. Yummy. I bet a similar recipe would work well with pork chops too.